Browse the Aruba Beach Resort frequently asked questions by selecting a category below. If you have a question that is not listed, please contact us. Yes - we require a security bond of $200. Yes- there is a lock-box outside the office with a phone adjacent. We try to be flexible with checking out - it depends on how many apartments need to be serviced. Yes. Theme park tickets are $10 cheaper than buying them at the theme park. Another advantage is you avoid the queues. Wireless Internet is available. You need to ask for a Wi-Fi voucher at Reception upon check-in. Free, secure under-cover parking is available. If guests stay for more than 7 days, their apartment gets a mid-service clean. 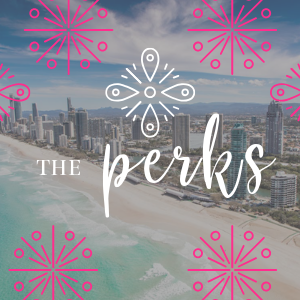 The famous Surfers Paradise is a short bus or light rail trip away from Broadbeach. Yes- there are many cafes and restaurants close by, the nearest is just 50 metres away. Fashion stores are located at the Oasis Mall and Oracle centre, just a five minute walk away. Pacific Fair Shopping Centre (one of the largest in the southern hemisphere) is a ten minute walk, or a short bus ride. There is a bus stop 30 metres from our main entrance on both sides of the road. You can travel directly to Surfers Paradise and SeaWorld. There is another bus stop just 100 metres away which takes passengers to the other theme parks. All Theme Parks (SeaWorld, MovieWorld, Wet'n'Wild & Dreamworld) are accessed by a bus stop outside of our property. We also have the Southern Hemispheres largest shopping centre (being upgraded) with New Style Shopping, Food and Cinematic Experiences awaiting your next visit at Pacific Fair Shopping Centre. Oasis Shopping Mall is three blocks from Aruba Beach Resort and there is a large Woolworths store there. Round the corner there is an IGA store. Q: How close is the Gold Coast Convention Centre? The Convention Centre is just a short 3 minute stroll away.